Who better than a dog to teach kids about reducing anxiety? Studies show that kids who have a pet dog are less likely to experience childhood anxiety — which is why lovable and anxious worrywart Moose makes the perfect canine protagonist in the new children’s book Moose the Worry Mutt Goes to Doggie Daycare. Written by licensed psychologists Dr. Jaime Crowley and Dr. Kristen Ohlenforst, the clever story uses a pessimism-fueling flea named Fret as the impetus for anxiety, as he constantly hovers around Moose. This gives children a tangible, concrete understanding of that nagging, oftentimes destructive inner voice that, like Fret, always seems to be whispering in the ear of an anxious person. We see Moose’s journey from downtrodden and fearful to FED-UP with Fret’s bad influence. That’s when Mighty Moose makes his debut, the symbol of the strong, supportive inner voice that’s also inherent in Moose. Mighty Moose and Fret go head to head in an inner thought battle and as Mighty Moose stands his ground, Fret gets weaker and smaller. Moose the Worry Mutt Goes to Doggie Daycare is a wonderful resource to help kids understand and cope with anxiety. If only evolved books such as this had been around when we were children, offering insight into how to navigate the extraordinarily complex psyche. Adding to the book’s charm, the story is based on the life of Moose the chocolate Lab, who is actually Dr. Jaime Crowley’s real-life dog, and, you guessed it, quite the worrier. Illustrator Holly Weinstein does a superb job at giving life to the equal parts vulnerable and heroic Moose, as well as the supporting characters, via her playful, charming drawings. Go fetch a copy of this book stat to add to your family’s library. Who better than a dog to teach kids about reducing anxiety? 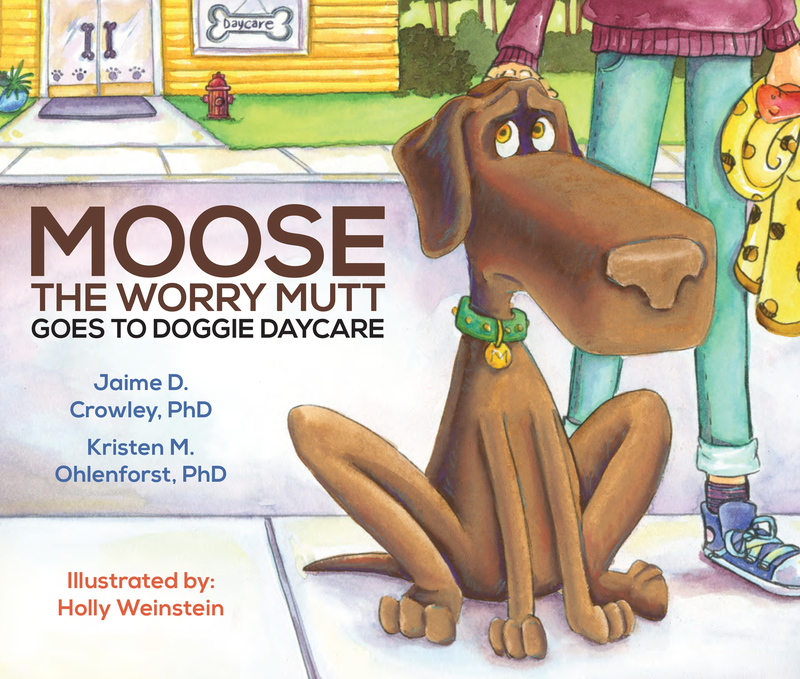 Studies show that kids who have a pet dog are less likely to experience childhood anxiety -- which is why lovable and anxious worrywart Moose makes the perfect canine protagonist in the new children's book Moose the Worry Mutt Goes to Doggie Daycare. Written by licensed psychologists Dr. Jaime Crowley and Dr. Kristen Ohlenforst, the clever story uses a pessimism-fueling flea named Fret as the impetus for anxiety, as he constantly hovers around Moose. This gives children a tangible, concrete understanding of that nagging, oftentimes destructive inner voice that, like Fret, always seems to be whispering in the ear of an anxious person. We see Moose's journey from downtrodden and fearful to FED-UP with Fret's bad influence. That's when Mighty Moose makes his debut, the symbol of the strong, supportive inner voice that's also inherent in Moose. Mighty Moose and Fret go head to head in an inner thought battle and as Mighty Moose stands his ground, Fret gets weaker and smaller.